I logged into my this afternoon because I have been trouble crossposting from diigo and I discover that the redesign and new features are finally here! Immediately noticeable is the site is fast! I wouldn’t care if they added a single feature or a new design as long as they kept the new speed. As much as I love delicious for storing, sharing, discovering and accessing bookmarks from anywhere, the speed has always been slooowwww. Navigation has been reorganized into three main sections; Bookmarks, People and Tags. Search has been enhanced and you can now search your bookmarks, a bundle, your networks bookmarks and more. The tag bar is a new feature that enables searching bookmarks by tags and tag combinations. And even nicer – it includes autocomplete! It is now super easy to navigate to tags related to the bookmark directly from the bookmark. Each bookmark’s save count is also contained in a blue box. The darker the blue and the bigger the box visually shows how many people have bookmarked that page. Clicking on the blue save count box will give you the complete history of the bookmark and will show you in your network has also saved that page. 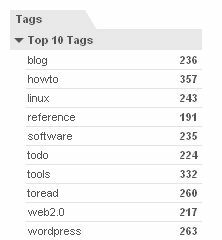 The sidebar still lists all of your tags but a feature that I really like is that your top 10 tags are moved to the top. This gives a quick way of telling if another user’s interests are similar to yours. Overall, I really like the new design and features but it should have happened sooner. I wish all bookmark pages contained an image of the site like the popular page does and I wish there was more of a social community to the site, similar to diigo. Hopefully, this is only the first wave of improvements.